When I bought my first Kobo in December 2011, I was wary. Would my eyes get tired reading on a screen? Would it be weird to not have to turn physical pages? What about the weight of the device vs the familiarity of a book balanced in your hand? The experience on the Kobo Touch was by no means perfect, but my hesitation was allayed immediately. It was a revolution for me–the ability to hold hundreds of books at my fingertips alone was worth the investment. And my concerns were unfounded; my only real gripes with e-reading were that the response on my Touch was sometimes laggy (or crashed completely–eventually causing me to replace the device) and some books are just way too overpriced (pricing a “traditionally published” book at full jacket price is ridiculous compared to $1 Indie books that are just as good–or better). But some of the same questions came to light when I had to replace my device this weekend. I had a choice between getting another Touch–a device I was overall very pleased with–going with their new Kobo Glo (which seemed much like a Touch with a ‘night light’ feature), and going all for broke with the pseudo-tablet Arc. Which is what I did. I did an amount of research on all three devices before coming to this decision, and it was only after playing with the Arc after purchase was my choice validated. Perhaps not surprisingly, most of the reviews and comments on the Arc are about the tablet features, not the reading experience–but it is, first and foremost, an e-reader. So I thought I’d explore my experience with that today. If the Kobo Touch was a revelation for me, the Arc is a revelation. It took no more than half an hour for me to decide this was an excellent reader. And yes, a lot of the reason behind that are the tablet features, which I talked about on Monday. But I’m very pleased with using eBooks on the device too, and this is what I’ll be using the Arc for most, voracious reader that I am. The first–and potentially biggest–plus of this device is that you can access more than just the Kobo Store. Yes, the Touch and other Kobos allow you to sideload books, and even .pdf files–but because the Arc has access to Google Play, you can also download the Kindle and Nook apps. There are a number of Indie authors who use Amazon almost exclusively, including a favourite of mine, Ryan Casey. I used to have to read his books on my computer, which wasn’t as convenient–now I’ve got his books in my library, alongside all the others. Another great app is Overdrive Media Console, which allows access to many public library systems. 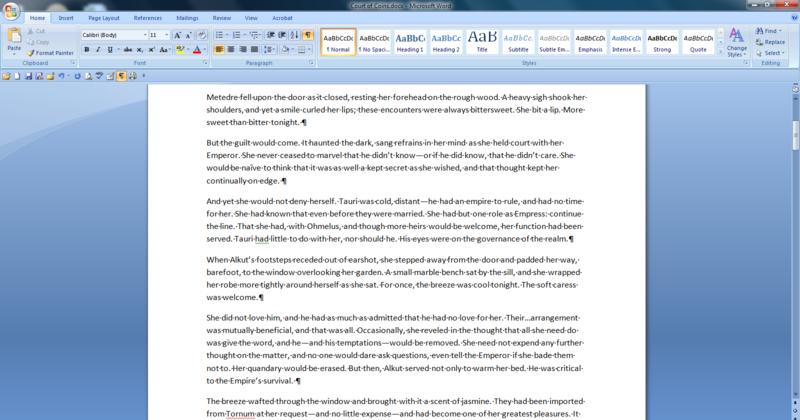 I have this on my desktop; with the Touch, I’d have to download a borrowed eBook to my computer and sideload it. With the Arc, I can do everything on the device–and I have access to audiobooks as well. It’s a truly amazing feature, which only gets better as my public library expands its eBook collection. Reading on a backlit screen was one of my major concerns. The Touch used e-ink technology, and looks about as close to a real book as an electronic gadget can get. The Arc is definitely a computer screen, and this can cause eye strain. But in practice, I haven’t found this to be an issue. I’ve logged more than a dozen hours of use over the last several days, and haven’t had a problem. Part of the solution was the option to change the page colour to sepia–this is a bit easier on the eyes than black text on white. You also have a “night mode,” which is white text on black, but I think this would just be worse. The screen is just fine for reading. The Touch was compatible with ePub files, and could also read /mobi and a few others. You could read .pdfs, but it was cumbersome; you had to drag the image across the screen to zoom/pan and change the page, and the responsiveness of that screen wasn’t too hot. And of course, it was all in greyscale. The Arc, being a colour device, has a definate advantage. Pdfs look just like they would on a computer screen, and the Arc’s screen in particular is very sharp. Images and colours really pop. Kobo says the Arc can’t read pdf’s natively, but I don’t remember downloading a pdf reader, and I’ve been reading them since I got it. This is a feature I can see myself using a lot. On top of pdfs, the Arc has access to Comic readers in the Google Play Store. I’m not a huge comic fan, but I like certain titles–Conan and Star Trek among them. The Touch would read these if prodded, but again, it wasn’t a great experience–the Arc on the other hand was made for this kind of thing. Images are crisp and vibrant, and scrolling is a breeze. Many different apps have different features too, so the mileage you get from this will depend on what you use. My absolute favourite feature on the Touch was the option to create a “Shortlist” of titles. I used this to line up all the books I wanted to read next, and I got into the habit of reading two or sometimes three books at a time, depending on the mood I was in. The Shortlist made it easy to switch form my “tired and want to escape” fantasy titles to the more “I wanna learn something” non-fiction choices. The Arc doesn’t have this feature, and to be honest, that almost made me considering the Glo. If not for the Arc’s other features, I would have gone that way for this feature alone. But, although there’s no Shortlist, the Arc has a similar feature: Tapestries. Check out Monday’s post for a discussion about that; in short, it’s essentially an interactive folder. I made a new one, called it Shortlist, and filled it with my next read books. Problem solved. What’s better is that I can add as many Tapestries as I want–I have another in which I’ve collected all my Indie books for quick reference. Another downer is the Discovery Bar. I was actually looking forward to this feature; the Touch had something similar, but because the internet was spotty at best, I didn’t use it much. On the Arc, it actually works. The Discover Bar basically gives you reccomendations for new things to read or webpages to explore, based on what you use with your device. It’s a great idea, albeit one with an obvious commercial aim. But I love finding books I never otherwise would have, and this feature is great for that. Sadly, it’s not always accurate; I’ve marked several items as “not interested” multiple times, and they keep popping up–and for some reason, the Arc thinks I’m crazy about romance novels (clarification: I’m not. At all). Kobo says this feature needs to be used for a week or so to properly report your interests, so I’ll give it a chance–but so far, I’m not too impressed. The final negative is the battery. My Touch could go on average three weeks without a charge–the Arc requires a full charge every day. If I time it well enough (i.e. overnight) it’s not a big deal–and with the colour screen and multiple uses, it’s not a surprise. It is, after all, almost as much a tablet as the Galaxy Tab or Nexus. Still, it’s a glaring change, and one that will take some time getting used to. Fortunately I’ve taken to using it as a calendar and music player at work, so I can plug it in all day as it sits on my desk. Problem solved. As if it wasn’t apparent, I’m very much a fan of this device. I loved the Kobo Touch and because a dedicated Kobo customer over the past year, and this product only cements that further. If you’re in the market for an e-reader and are thinking about a tablet, you can’t go wrong with the Kobo Arc. Next Monday, look for my first regular weekly review! I had a good ten days off this holiday season, but didn’t write a word. Oh, I intended to–I figured I’d at least finish off the first draft of my Courts series (which you can read more about on my Books page). It’s my habit to get up a bit earlier than my wife each morning, take the dog out, and do some writing before the day starts–but this holiday, I found myself with different priorities. Just as the holiday started, one of my favourite indie authors, J. M. Ney-Grimm, released a short story called Perilous Chance. I picked it up right away. I also found a couple books at the library that I’ve been wanting to read for some time–Captain Nemo and Death Warmed Over by Kevin J Anderson. After Christmas, I used a gift certificate to pick up another of his books, Clockwork Angels, which has been on my reading list since the release of the Rush album it was written alongside. Needless to say, I had a lot of reading material this holiday. I didn’t get any writing done, but I read several books, almost all of them indie. And you know what they say. A writer should always be reading. So this gave me an idea. If you’ve been following my blog, you know that occasionally (once or twice a month) I offer an Indie Review–a look at a book written and published by an indie author. Since I’ve not been posting over the holiday and got so much reading done, I figured I’d catch up with a special series of reviews this week. So, over the next four days, keep your eyes open for some great Indie work, featured right here! We’ll start tomorrow with a writer I was introduced to by happy accident after mistyping a title in the Kobo search bar–Leah Cutter.